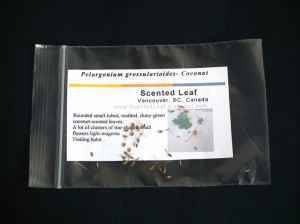 ScentedLeaf is helping him and offers one Giveaway: a FREE pack (10 seeds) of Coconut Scented Pelargonium aka Pelargonium Grossularioides. Simply enter your information on the Rafflecopter form. There's no mandatory entry ... all of them are strictly optional and easy to complete. If you don't have these social media accounts, get them! They're totally free and worth the extra entries. UPDATE December 12th, 2011: The winner has been announced and contacted. "Santa Claus and ScentedLeaf Giveaway 2011" . My favorite scent is Coconut. It smells so yummy.